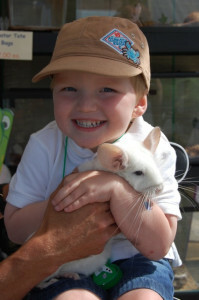 Guests meet, touch and learn about 8-10 of our amazing animal friends. We travel to your event for an exciting hour long, hands on presentation that is suitable for “kids” of all ages! 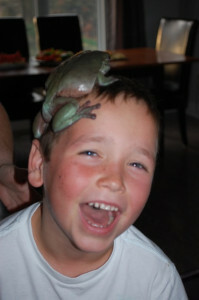 Presentations include a selection of reptiles, birds, amphibians, invertebrates and mammals. Have an animal that you’re super excited to meet? Why not add it to your Critter Wish List! While we can’t guarantee that all animals chosen will be able to attend your event, we will certainly try to bring as many as possible. After the exciting Basic Safari presentation, each guest chooses their favourite critter to pose with for a unique souvenir to take home. What a fantastic way to remember the day! Photos are taken on a digital camera and printed on site. Package pricing includes 10 photos. Additional photos are available for $3.00 each. *At any time, presenter may suggest or substitute an animal for the photo if he/she feels the chosen animal or child is not comfortable. A fun way to keep party guests busy and happy. Makes an exciting alternative to traditional loot bags when added to the Photo Safari! Includes 5 plain wooden frames plus a large selection of craft supplies with which to decorate them. *Additional frames (& supplies to decorate them) are available for $4 each. *Prices are valid for Shelburne and surrounding areas (within an hours drive). Outside of area, reasonable travel charges will apply.